[handwritten note] See also A:2081 - 1-23 [end handwritten note] December 2, 1919. Mr. B. R. Winslow, 2022 East Hoffman St., Baltimore, Md. 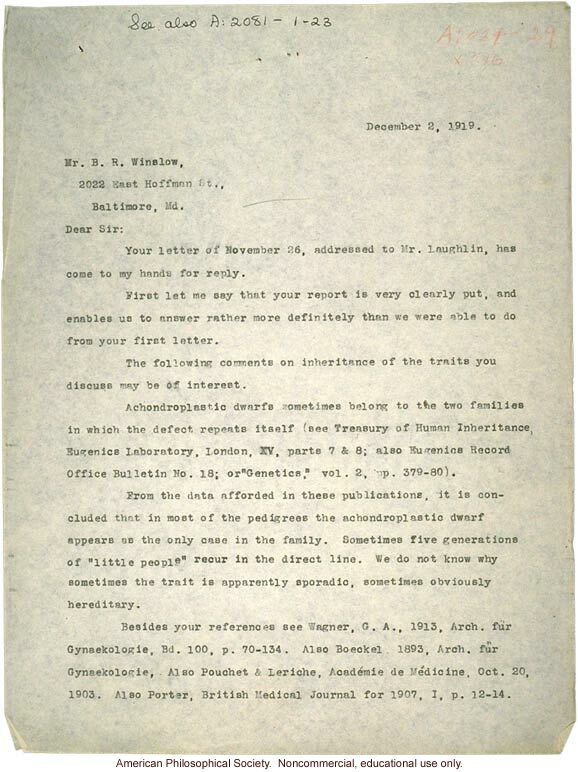 Dear Sir: Your letter of November 26, addressed to Mr. Laughlin, has come to my hands for reply. First let me say that your report is very clearly put, and enables us to answer rather more definitely than we were able to do from your first letter. The following comments on inheritance of the traits you discuss may be of interest. Achondroplastic dwarfs sometimes belong to the two families in which the defect repeats itself (see Treasury of Human Inheritance, Eugenics Laboratory, London, XV, parts 7 & 8; also Eugenics Record Office Bulletin No. 18; or "Genetics," vol. 2, pp. 378-80). From the data afforded in these publications, it is concluded that in most of the pedigrees the achondroplastic dwarf appears as the only case in the family. Sometimes five generations of "little people" recur in the direct line. We do not know why sometimes the trait is apparently sporadic, sometimes obviously hereditary. Besides your references see Wagner, G. A., 1913, Arch. fur Gynaekologie, Bd. 100, p. 70-134. Also Boeckel 1893, Arch. fur Gynaekologie, Also Pouchet & Leriche, Academie de Medicine, Oct. 20, 1903. Also Porter, British Medical Journal for 1907, I, p. 12-14.